The Hindu Identity. What is It ? What makes a Hindu ? I have been pondering over this question for a while. And the truth is I am struggling to come up with a clear definition. It has been equally hard to find an academic definition that works. Simply speaking, ‘Hindu’ is a term given to and adopted by the people who lived on the other side of the Sindhu River i.e the Indian sub-continent. This is primarily a geographical definition and is both inadequate and largely irrelevant in our times. There are as many non-Hindus in India today as there are Hindus outside India. One could say a Hindu is a person who follows Hinduism. Which is true to some extent but not entirely and not as simple as it sounds. ‘Following Hinduism’ takes many forms. For under the umbrella of Hinduism there are myriad sects, traditions and schools of thought. Some shockingly different from each other yet co-existing as part of one. For instance,while a majority of Hindus worship the extensive pantheon of gods, there is a section that worships only the nameless, formless (nirguna) form of God. While some believe in the non-dual aspect of God many others believe there is a fine veil that separates individual consciousness from the cosmic consciousness and the two can never truly merge. The gods themselves look different and are called by different names across various regions. Same festivals are celebrated in various ways and traditions too have their regional differences. Even the popular mythological tales have their own regional flavour, meshed with local folklore and told in regional languages. To make matters even more complicated, different Hindus may follow some or neither of these traditions, subscribe to some or none of these beliefs and still hold on to their Hindu Identity. A Hindu sadhu or an ascetic who is seen as very religious often forsakes all notions of God and religion. He finds his own spiritual path. So ‘not practicing’ is as valid in Hinduism as ‘practicing’, and has its own place in the spectrum. You may not follow Hinduism then and still be a Hindu. Furthermore, you maybe an atheist, not believe in God and still be a Hindu. Perhaps, a Hindu is determined by birth. Yes, that is often the case but not always. 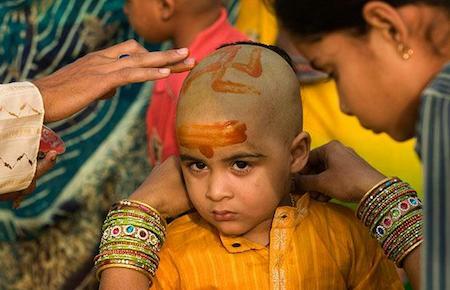 Increasingly, across the world, there are many who are not born into Hindu households yet adopt some of its tenets and consider themselves Hindus. At the same time there is no concept of conversion in Hinduism. You are a Hindu if you think you are ! With no single founder or authority at its centre, Hinduism has evolved organically over a long period of time. There is no single text laying out the rules of conduct or answers to existential or ethical questions. I read somewhere that Hindus don’t have a religious text but more like a reference library with hundreds of texts. If you know what questions to ask, you can look for the answers. In fact, in Sanskrit there is no real equivalent of the word ‘religion’. The word that comes closest to it is Dharma and encompasses everything from an individual’s faith and religious traditions to social structure, sense of moral duty and code of ethics. To give a religious identity to a group of people based on a such a diverse social system leads to stereotypical definitions. For example, Hindus follow the caste system, have several gods, believe in idol worship, are vegetarians, view cows are sacred etc, etc. All of which are true only in part. There are of course some common beliefs like karma or re-incarnation but these beliefs are not confined to Hinduism alone. In short the Hindu identity is as complex as the Hinduism itself and almost impossible to define without falling into stereotypical cliches. I personally think that for a Hindu his identity stems as much from a sense of shared heritage and culture (either by birth or by choice) as it does from belonging to a religious group or praying to certain deities. Sometimes even more so. Not to compare it with any other religion or faith in the world – because such comparison only result in needless debate, I guess the fundamental thing which differentiate Hinduism is the extreme flexibility and sheer diversity of thoughts it offers. Thank you Bhuwanchand. It was a a challenging post to write so I am glad you agree.